Safely delivered at the second attempt. It was fitted and the bike started on the button. Excellent product and fast service. Quality product, would purchase again from this company! Great battery, excellent service, prompt delivery. My only criticism is you could have supplied a new breather pipe. Not serious as I reused the old one. great product at a good price. Battery arrived already filled due to the new regulations regarding acid and was very safely sealed and wrapped. works well. comes fully charges when acid is added. Excellent battery works a treat and arrived so quick, many thanks. 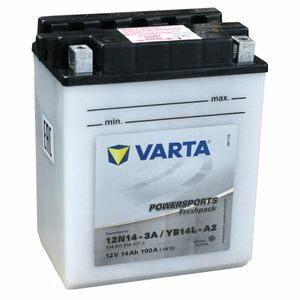 A good value for money motorcycle battery, I would buy again. Battery arrives with separate acid container - and confusing instructions as to what to do. A nusiance (and a hazardous one) to have to handle sulphuric acid.. The screws for the battery terminals are infuriating short, which makes 'catching teh thread' to tighten them difficult. Delivery excellent and packaged well. Followed instructions and after an hour was good to go. Very satisfied with this battery. Arrived next day. Filling Okay. All seems good.